Hastings Diversified Utilities Fund has recommended that security holders accept the takeover offer from Pipeline Partners Australia. The offer is $2.3251 per security. The independent directors of the manager, HFML, unanimously recommend the offer subject to no better offer coming along and an independent expert's report concluding the offer is fair and reasonable. HDF has entered into a Bid Implementation Deed with Pipeline Partners Australia that values HDF's equity at $1.232 billion. CBD Energy has signed its first solar PV installation contract in the US. The US$3.8 million project involves installing multiple rooftop and carport solar PV systems to supply power a school in New Jersey. Excess power sold to the grid. Westinghouse Solar, Inc. will partner with CBD. The project is expected to be completed in about mid October, and the financial impact should be recognized in the second half of 2012. ERM Power's exploration partnership with Empire Oil & Gas NL, Key Petroleum and Allied Oil & Gas Plc sees it gradually becoming more involved in oil exploration and drilling. The partners are planning to drill for oil in the North Perth Basin in WA. These are shallow oil prospects in permit EP 432 and EP 454. ERM has farmed into 12 blocks in EP 432 to earn an additional 35 per cent interest by funding 60 pr cent of Empire's share of the exploration well, Black Arrow-1. ERM Gas Pty Ltd's interest in Area A after the farm-in will be 47.5 per cent. Empire Oil said the the Black Arrow structure covers 3,600 hectares and has estimated potential recoverable oil of 10 million barrels. Area A also has a very large unconventional shale gas resource. An independent evaluation will provide an estimate of the potential recoverable resource. Empire has farmed into the shallow rights for EP 454 to earn an additional 33.33 pr cent interest by funding ERM's 50 per cent share of the exploration well. After the farm out, ERM Gas Pty Ltd will hold 16.66 per cent. Empire describes this area as an "exciting oil prospect" and will drill this Charger Prospect well after drilling Black Arrow-1. Empire said "The oil prospectivity of the Yarragadee is demonstrated in the oil recovery from the Dandaragan-1 well located to the south. Oil and gas is sourced from lacustrine shales of the early Jurassic Cattamarra Coal Measures in the deeply buried Dandaragan Trough. Empire's Gingin West-1 and Red Gully-1 [gas] discoveries were charged from the same source rocks. "If the Charger Structure is oil charged, the volume of oil in place could be a very large 205 million barrels of oil. Empire has used a conservative recovery factor of 10 per cent with recoverable oil estimated at 20 million barrels if hydrocarbons are discovered and the structure is filled to its spill point." It seems that the prospective oil reserves are close to related to the gas reserves that ERM Power and Empire Oil are developing at Gingin West-1 and Red Gully-1. 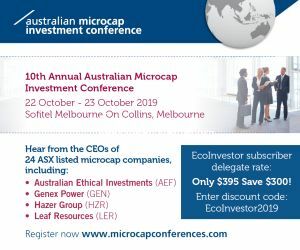 August Investments has released its June quarter valuation, which shows that it has sold its holdings in Energy Developments and Lynas Corporation, along with Australian Ethical Investment (Update 25 June 2012). It has bought into M2 Telecommunications, increased its holdings in Blackmores, Carbon Conscious, Carnegie Wave Energy, Energy Action and IOOF, and reduced its holding in Geodynamics. Ceramic Fuel Cells said its 2011-12 revenue was $6.5 million, 75 per cent up from $3.6 million in 2010-11. 169 units were sold and booked to revenue in 2011-12 of which 76 were in the June quarter. The order book rose 108 per cent from 30 June 2011, and the sales outlook for 2012-13 is strong, particularly in Germany. Aeris Environmental is entering a strategic partnership with Mycologia Pty Ltd by selling it its cold storage direct service business Aeris Hygiene Services (AHS), and giving it an exclusive operating license for the AerisGuard brand and the AerisGuard product range for the Australian cold storage market. The companies said the deal follows a longstanding relationship between them, and will support the rapid expansion of their leadership and sales in this growing segment. Aeris Hygiene Services was launched in June 2006 and now has customers such as Woolworths, Coles, Tip Top, Costa Group, Moraitis, Bidvest, GSF and General Mills. The sale includes the purchase of some of AHS's operating assets and relevant client base, agreements and work in progress as at the settlement date of 13 August 2012. Mycologia and Aeris will also work together to evaluate technical and commercial opportunities for mould remediation and microbial control technologies Aeris is currently developing. Mycologia is committed to grow the business, and to agreed minimum levels of performance in the cold storage market. The terms of the transaction are confidential. However, Aeris received an initial payment on signing the Memorandum of Understanding, and will receive an additional payment on contract close, together with agreed milestone payments and ongoing substantial purchases of the AerisGuard product range. Mycologia has expertise that can be scaled into Aeris' global business and Mycologia will have access to Aeris' pipeline of innovative technologies that will be tailored to the needs of its customers. Aeris is negotiating with potential partners in Asia who are looking to take up exclusive licences similar to the Mycologia model. The potential for generating additional licences into other global markets is significant, said Aeris Environmental chairman, Maurie Stang. The deal frees considerable resources that can be applied to scale Aeris' core platform technologies into the global market. Carbon Conscious is forecasting a net profit after tax of $3.5 million for 2011-12 on revenue of $16 million. Basic earnings per share would be 4 cents. As part of its strategic review, Clean Seas Tuna has engaged BBY Ltd as corporate adviser to assist with the implementation of the strategic alternatives it has available to it. This includes identifying and working with any future partners for its Hiramasa Kingfish business. Clean Seas has a sustainable market for premium grade Hiramasa Kingfish in Australia, Asia, America and Europe. The Strategic Review confirmed the potential of Hiramasa Kingfish for sustainable long term aquaculture production through seacage grow-out, as presently practiced by Clean Seas, and through purpose built growing facilities. Clean Seas is in early discussions with a number of parties about its Hiramasa Kingfish business. Intec has become a substantial shareholder in Bass Metals Ltd with a 5.85 per cent interest. This is based on the restructure of the Hellyer Processing Royalty which was part of the consideration for the sale of the Hellyer Assets to Bass in late 2008. In November 2011, Intec reached agreement with Bass to forgo cash royalty payments for completed and anticipated minerals processing until the end of calendar 2011 in exchange for receiving 3.1 million Bass shares at 15 cents per share, each with a free attached three year listed option exercisable at 20 cents. In May 2012, Intec received $345,056 under the royalty from processing activities during the March quarter, and will receive $454,000 for ore processed during the June quarter. However, with the Hellyer Mill now on a care and maintenance basis and investigations underway about its sale, Intec said it was apparent that the residual value of the royalty was imperilled; hence, the agreement to re-structure the royalty in each party's interests. Under the restructure, Intec is granted a 2.5 per cent net smelter return royalty (NSR royalty) for base metals extracted from five tenements. The NSR royalty is uncapped and Bass has no first right of refusal or pre-emptive rights over it as was previously the case. Intec was also issued 15 million shares in Bass, bringing its shares in Bass to 18.1 million plus the 3.1 million options. RedFlow director Anne-Marie Birkill has resigned due to other work commitments. Operationally, the company has placed a full-time business development manager in the US; plus five trial units with a range of potential customers and system integrators. These are early steps to secure interest in its large scale demonstration programs. Refresh Group has issued 12,282,859 new shares. 10 million were to Richard Tan at 3 cents each, raising $300,000 for working capital. Mr Tan has been appointed an Adviser to Refresh. Lithium producer Galaxy Resources has temporarily halted mining at its Mt Cattlin project in WA due to its high spodumene inventory levels. Recently improved production rates at Mt Cattlin and its processing plant, coupled with the Jiangsu Plant in China in ramp-up phase, resulted in a build-up of inventory to approximately 12 months' supply of feedstock for the Jiangsu Plant. The temporary halt will allow the spodumene stocks to fall to more manageable levels. It will also save $4 million per month. Ramp-up revenues at Jiangsu will not be affected. The ramp-up is on schedule, with the spodumene feed rate at the front end of the plant at 60 per cent of the design rate and increasing. The ramp-up is expected to take 12 months. Galaxy continues to sell lithium carbonate production from Jiangsu to technical grade customers at improved pricing, it said. All of Galaxys Mt Cattlin employees will be retained and will focus on process upgrade projects and maintenance to enable re-start when spodumene inventory levels are re-balanced; but Galaxy's onsite mining contractor will be demobilized until mining is ready to re-commence. Managing director, Iggy Tan, said "The Mt Cattlin Project was brought online ahead of schedule and has recorded strong production rates. The Jiangsu Lithium Carbonate Plant is three months into a 12 month ramp-up; resulting in an internal inventory imbalance. A pause in operations at Mt Cattlin is the best, and most financially prudent way to address this imbalance and difference in start-up profiles of these operations." Galaxy had cash of $21 million at the end of May. The lithium market outlook remains strong, with tight supply and sustained growth resulting in higher lithium carbonate prices in the key Chinese market, he said. This follows a 22 per cent price increase on lithium products announced by major producers Rockwood Lithium and FMC Lithium." Some downward pressure on Carnegie Wave Energy's share price may have been removed with its major shareholder, Renewable Energy Holdings Plc, selling 53 per cent of its shareholding via off market transfer to a small consortium of Australian investors led by 88 Green Ventures (Australia). REH has also agreed to distribute its remaining Carnegie shares to all REH shareholders via an in specie distribution expected before the end of 2012. REH's remaining Carnegie shares will be held in escrow until the in specie distribution. The transaction is part of REH's announcement in April that it will dispose of all of its global assets. Carnegie confirmed that REH has been selling its Carnegie shares on the ASX from January 12 to June 29 this year to fund working capital. Managing director and chief executive officer, Michael Ottaviano, said "We are pleased that this transaction has taken place. It removes a large active seller from the marketplace and with it, the associated downward share price pressure. "Furthermore, it replaces REH with a small consortium of supportive investors with a long term focus, led by an existing shareholder with an outstanding track record in power and infrastructure investment." Prior to the transaction REH owned 215 million shares or 21 per cent of Carnegie. 114 million shares have been sold via an off market transfer to 88 Green Ventures, a Perth based family office, and two wholesale investors. The remaining 101 million REH shares are in voluntary escrow until they can be distributed to REH's shareholders. UBS AG (6 per cent), EDF Energies Nouvelles SA (4 per cent) and about 700 retail investors. This shareholder base would represent 8 per cent of Carnegie at current issued capital. Log Creek Pty Ltd, which is trustee for 88 Green Ventures, holds 6.27 per cent of Carnegie. 88 Green Ventures is a private investment vehicle formed by Mike Fitzpatrick, founder of Hastings Funds Management, to invest in global early stage venture capital and assist in the development and commercialization of green technologies. It has established networks with developers, investors, governments and advisers around the world to work with companies to achieve their goals and create a more sustainable environment. Shares in Panax Geothermal fell to a new all time low of 0.6 cents on 12 July. Three days earlier it announce a pro-rata renounceable rights issue to raise up to $1.6 million, of which $1.1 million is underwritten by Patersons Securities. The one for two offer is at 0.7 cents per share plus one free option for every two new shares and exercisable at 1 cent by 31 December 2014,. Ocean Power Technologies, Inc and Lockheed Martin are to develop a 19 megawatt wave-energy project in Portland, Victoria. It will be one of the largest wave-energy projects around. Lockheed Martin will assist with the design of Ocean Power Technologies' (OPT) PowerBuoy technology, lead the production and system integration of the wave-energy converters, and support program management. Funding for the project includes a previously announced grant of $66.5 million from the Commonwealth Department of Resources, Energy and Tourism. The grant requires the parties to obtain significant additional financing. The project will be developed by a special purpose company, Victorian Wave Partners Pty Ltd, currently owned by Ocean Power Technologies (Australasia) Pty Ltd. The partners are assessing financing opportunities and pursuing power purchase agreements with local industry and utilities. Lockheed Martin and OPT have been collaborating since 2004, first on the development of an Advanced Deployable System for the US Navy and most recently to design and launch utility-scale wave energy converters at Reedsport, Oregon. Dan Heller, vice president of new ventures for Lockheed Martin's Mission Systems & Sensors business, said "We see great potential in harnessing the vast power of the ocean. By working with OPT and Australian industry on this project, we will advance wave energy in Australia and globally." Charles F. Dunleavy, chief executive officer of OPT, said, "Lockheed Martin's commitment to alternative energy and its engineering, production, and systems integration expertise will provide momentum to our Australia initiatives, where both companies see great potential for large-scale wave energy generation. We also appreciate the Commonwealth government's continued support of this project." OPT recorded an operating loss of US$16.6 million for the 12 months to 30 April 2012 against a loss of US$21.3 million for 2011. This was mainly due to a 37 per cent decrease in product development costs.